Our fifth annual awards honor distinctive careers and public service. 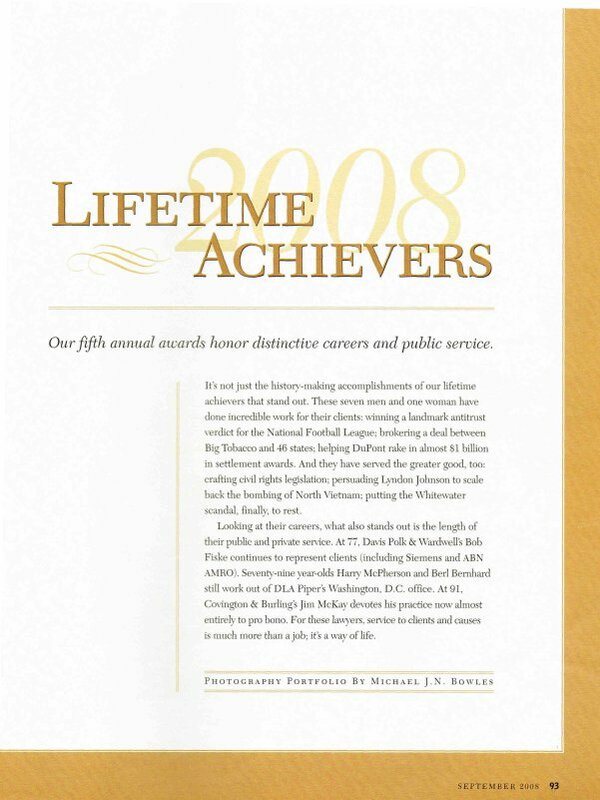 It's not just the history-making accomplishments of our lifetime achievers that stand out. These seven men and one woman have done incredible work for their clients: winning a landmark antitrust verdict for the National Football League; brokering a deal between Big Tobacco and 46 states; helping DuPont rake in almost $1 billion in settlement awards. And they have served the greater good, too: crafting civil rights legislation; persuading Lyndon Johnson to scale back the bombing of North Vietnam; putting the Whitewater scandal, finally; to rest. Looking at their careers, what also stands out is the length of their public and private service. At 77, Davis Polk & Wardwell's Bob Fiske continues to represent clients (including Siemens and ABN AMRO). Seventy-nine year-olds Harry McPherson and Berl Bernhard still work out of DLA Piper's Washington, D.C. office. At 91, Covington & Burling's Jim McKay devotes his practice now almost entirely to pro bono. For these lawyers, service to clients and causes is much more than a job; it's a way of life. IT'S ALL ABOUT THE FACTS. That's what 91-year-old Covington & Burling senior counsel Jim McKay emphasizes when he talks about his long career as a trial lawyer. And he remembers them vividly. Take, for instance, the criminal antitrust case McKay tried back in 1952 for E.I. du Pont de Nemours and Company, which was indicted with about a dozen other defendants for allegedly fixing the price of automobile spray paints. As McKay recalls it, one minor fact in the case turned out to be key. During depositions, a witness had remarked that the head of DuPont's paint division, a defendant in the case, had been complaining about his teeth. So McKay and his colleagues obtained his dental records. They showed that at the very moment the government claimed the defendant was at a meeting in Cleveland fixing prices, the defendant was actually having a wisdom tooth extracted. The jury returned a verdict in DuPont 's favor. DuPont was only one of McKay's many big clients, which included the old Pennsylvania Railroad and the National Football League. 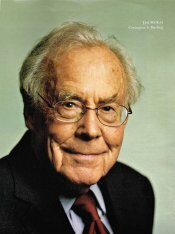 In 1975 McKay won a memorable antitrust verdict for the NFL. Player Joe Kapp had charged that the player draft system violated antitrust law. By the time McKay got the case, the judge had already found the defendants liable. But at trial McKay and his cocounsel convinced the jury that Kapp had suffered no damages. In 1987 McKay was tapped as independent counsel investigating Lyn Nofziger, a former aide in the Reagan White House who was accused of violating conflict-of-interest laws by lobbying on behalf of Wedtech, a defense contractor, within a year of leaving office. The case expanded to include Attorney General Edwin Meese. McKay recommended Nofziger's indictment, but with Meese, the situation was less clear-cut. "A lot of people are still upset that I issued an 800-page report that in effect said that the jury would have found [Meese] guilty," McKay says now. "But we didn't feel Mr. Meese had any venal intent. And we had gotten our message across." Meese resigned shortly after the report was released. Colleagues say that McKay was an obvious choice for independent counsel because of his reputation for nonpartisanship. "I actually have no idea what his politics are," says Covington's Mitchell Dolin, who has known McKay, for 25 years. Since the mid-nineties, McKay has devoted himself almost entirely to pro bono work. He's taken at least 24 pro bono cases for disabled veterans and worked for the repeal of a federal law preventing veterans from hiring a lawyer to help them file initial disability claims ["Casualties of War," July]. In April the U.S. Court of Appeals for Veterans Claims presented McKay with a distinguished service award. But when colleagues talk about McKay, the first thing they mention is not his achievements. Robert Weiner, associate independent counsel under McKay, now at Arnold & Porter, is typical: "Jim McKay is one of the most decent and nicest people I've met in my career."